Set your Fourth of July party on FIRE with Fireball Whisky and our new playlist. Guys! It's Rock Out With Your Cocktail Out's 3rd birthday! We've been supplying you with drinks and playlists since 2012. To celebrate, treat yourself to a staycation and head to a local club this month to see the likes of Catch 22 with Rebuilder at Brighton Music Hall on July 17th (tickets) and Beach Slang with Choke Up and Bundles at Great Scott July 22nd (tickets). Or just camp out on your couch and order the newest Great Lakes USA record, ‘Stumbling Distance’ on limited edition vinyl. Regardless of your plans, you should most definitely be drinking a Cherry Tree Fireball and listening to the July Spotify playlist. 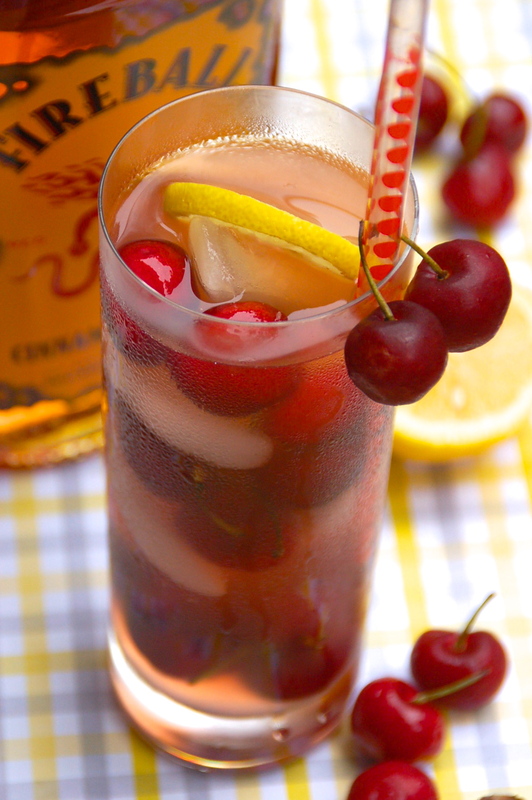 Muddle the fresh cherries in the Fireball Whisky, then strain into a glass filled with ice. Add the cherry lemonade and garnish with fresh cherries. Finally, press play. Make sure to head to Fireball’s website for even more recipes including Fancy Balls, Foxy Balls, Ginger Balls, Angry Balls and Balls-O-Fire. Craving more music and more cocktails? Head to our playlist archive for a complete list.